David Hancock initiated a study of bald eagles in the middle 1950’s on southern Vancouver Island, expanded this in the 1960’s to an extensive review of the eagle population productivity in sections of the Gulf Islands, Barkley Sound and parts of the Great Bear Rain Forest of central BC. In more recent years he has repeated some of the Gulf Island surveys but primarily concentrated on the nesting and wintering populations of eagles in the Greater Vancouver / Lower Fraser Valley area. The nesting populations have gone from 3 pairs found during the early 1960’s (immediately following the period when a bounty was offered by the State of Alaska for killing eagles) to an estimated over 500 nesting pairs now occupying the valley. David has recorded over 400 active nests in the lower valley. The wintering studies primarily focused on two study areas. The first was the Harrison-Chehalis River complex from the Fraser River upstream to include the Chehalis Flats. This region, while it supports over a half a dozen nesting pairs of eagles, is the primarily feeding and loafing area for eagles in the entire west central North American coast. One count on December 18, 2010 yielded 7362 eagles in a 3 km section of the Chehalis Flats. We are working at correlating the number of eagles with ecological variables, particularly numbers of salmon on the northern Alaska and BC rivers but also with variations in the onset of winter freezing. The other study area is the central region of Boundary Bay from the water’s edge inland to include the Landfill enclosure north of Highway 99 and bounded to the east by Highway 91 and to the west by 64th Street. This area is proving to be not just a prime breeding habitat (78 active pairs nested in City of Delta in 2016) but is likely representative of the best year round eagle habitat in the human enriched environment. Following the end of available spawned out salmon carcasses along the Harrison River in the winter of 2010, the numbers of eagles at the Landfill jumped from a low summer population of about 50 to over 1300 eagles as the eagles dispersed from salmon rivers to new possible feeding locations. This year, 2017- 18 winter, approximately 3000 eagles were present into early February. For obvious reasons this region is also where we are concentrating the BETA Project trapping & transmitter attachment studies of bald eagles. While the Boundary Bay intertidal flats are probably the most productive bald eagle habitat on an annual basis for all of North America, the supplemental attraction of both the Vancouver City Landfill and the adjacent soil making farm to the south greatly supplement the feeding options of the eagles between the key salmon runs and the time of herring and eulachon runs in the early spring. Normally beach scavenging of marine mammals and fish would fill is some of the losses if the salmon spawns were low or wiped out. Evaluating the importance of these seasonally, yet temporarily used, food sources to the juvenile eagles is one of the present questions being investigated. 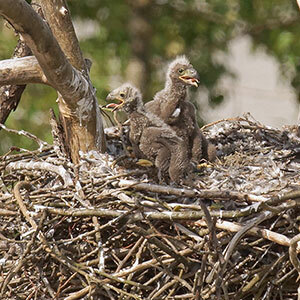 Since 2000 I have documented the eagle population up to twice a month. This project is proposed to be an ongoing study to evaluate population changes over time and is the background data against which to evaluate some of the meaning of the BETA Project tagging. 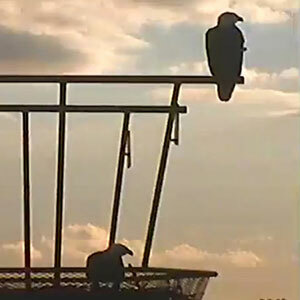 This coming year we are again hoping to incorporate another graduate student for observations on the wintering eagles. The previous student from McGill just completed his MSc on the nesting success of the lower mainland eagles, with particular focus on those of the City of Delta region. So many of the HWF projects on education and science revolve around our incredible population of wintering and breeding eagles and protecting their habitat and making the locals aware of this incredibly unique resource. If our area hosts the largest populations of bald eagles known, surely we have the responsibility of knowing something about their comings and goings. I appreciate all your private support of our projects, the City of Vancouver and greater Vancouver Cities for opening up their parks and facilities and all the cooperating NGO’s who encourage us to share our concerns with their people. I did not name Vancouver the Bald Eagle Capital of the World, for nothing – but now we share the responsibility of keeping it that way.